NEWLY REMODELED DUPLEX! 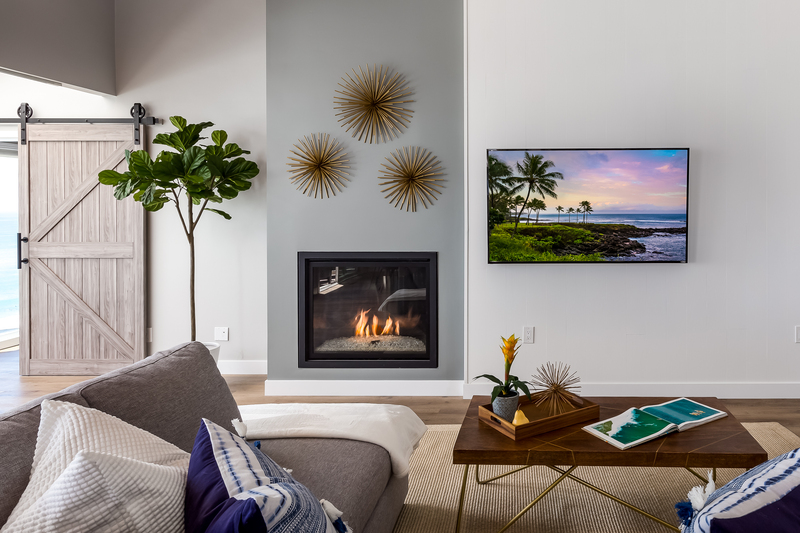 Featuring brand new appliances and furnishings, this home makes the perfect family vacation getaway in one of San Diego's greatest coastal cities, Encinitas. 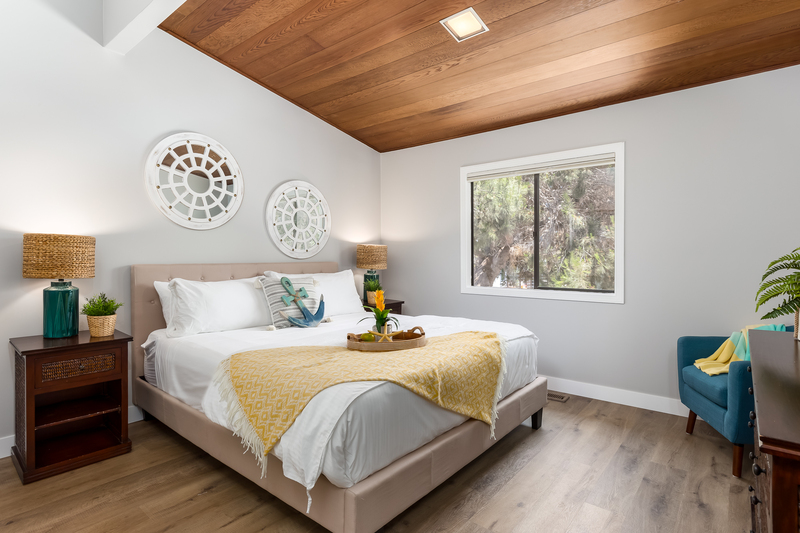 Between its' vast rooms, open floor-plan concept, and vaulted wood ceilings, this house provides guests with a rather spacious feel and plenty of room to roam for the little ones. 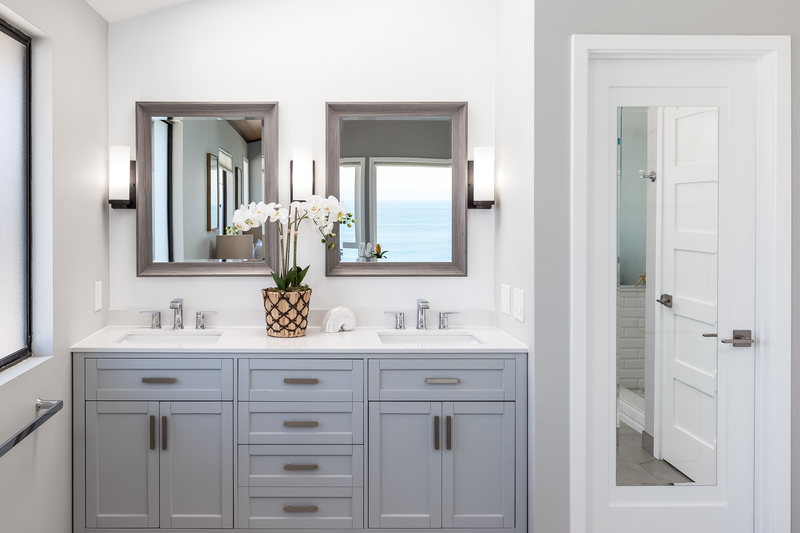 This unit will help fulfill your inner chef dreams with its' up-to-date stainless-steel appliances, an absolutely gorgeous marble back splash, a great kitchen island, 2 massive kitchen sinks, and a fantastic view of the Pacific Ocean. Directly tangent to the kitchen there is a modern living space to gather around, whether it is to watch your favorite show, to simply chat near the fireplace, beat your fellow guests at a board-game, or relax and just take in the wonderful sights and sounds of the waves crashing right outside. 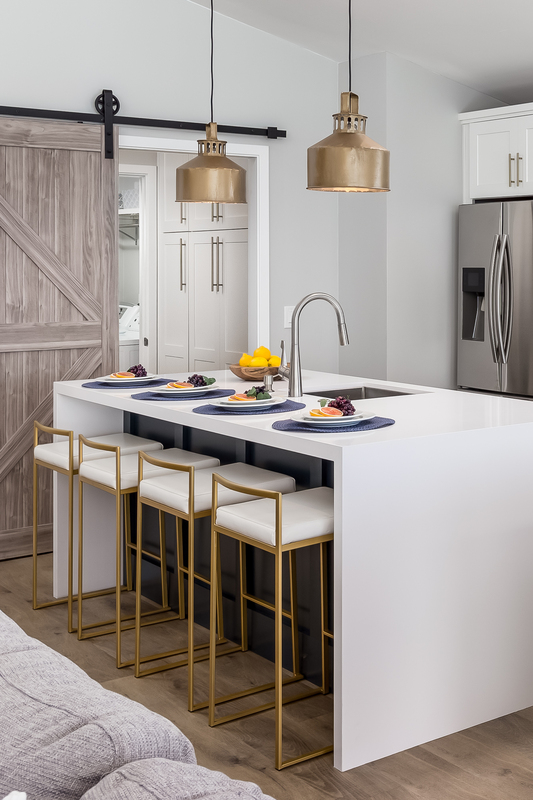 Continuing on with the open concept of the house, there is a wonderful dining space featuring a table that can seat roughly 8 people with a beautiful brass light fixture hanging directly above. 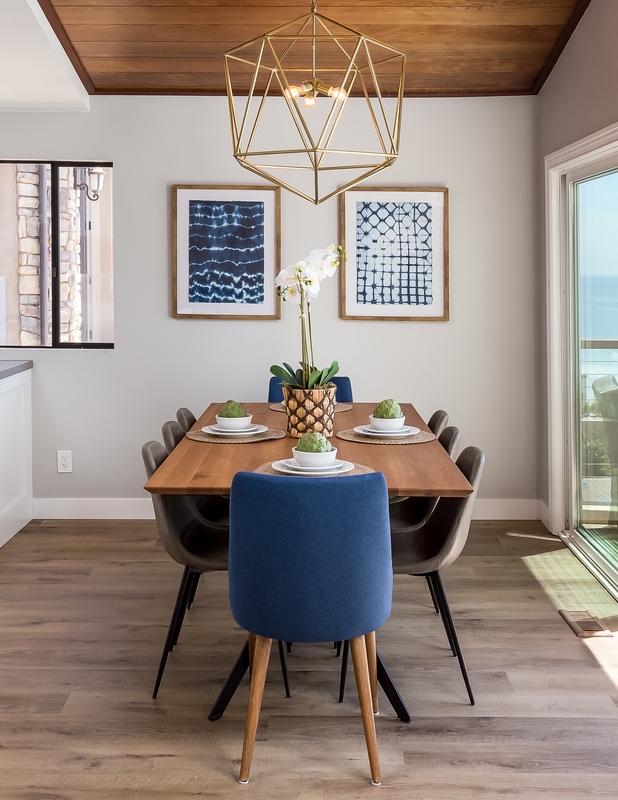 The dining room overlooks a nice, quaint deck, the perfect place to either sip your morning coffee or to capture that marvelous sunset picture. 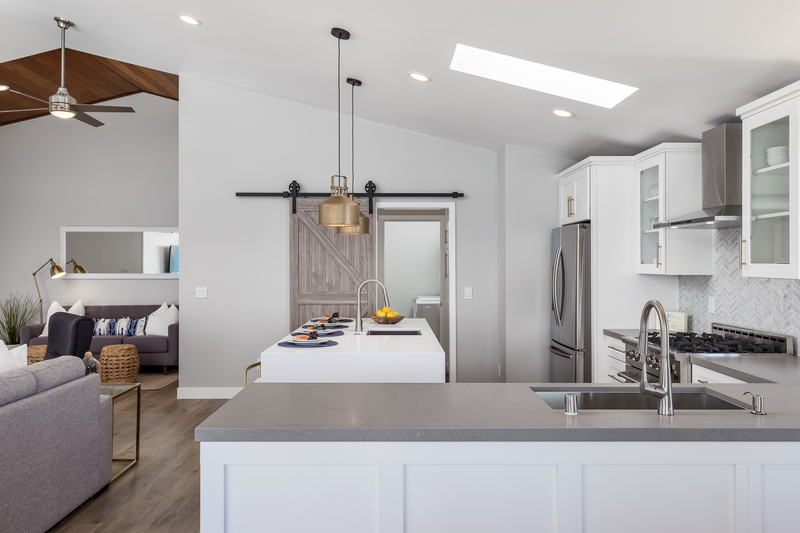 Throughout the house there is a great balance of modern and rustic chic by intertwining touches of wood as used in the sliding barn doors to the light color palette on the walls. 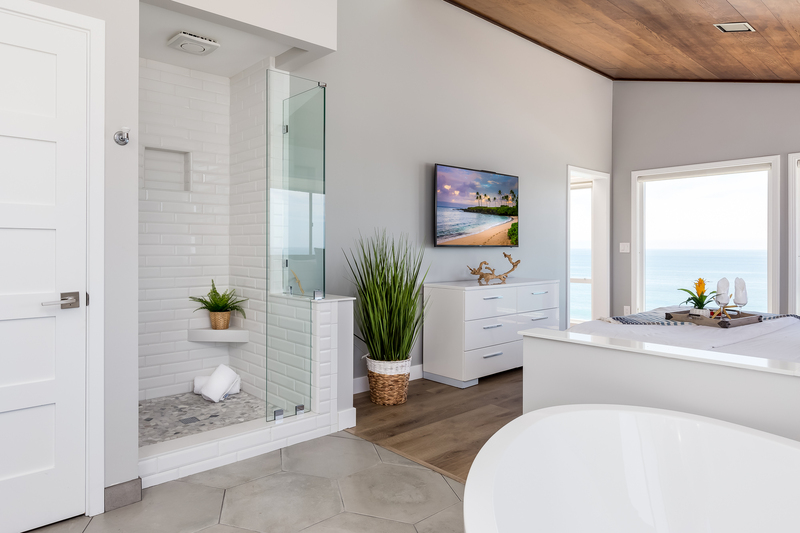 Adjacent to the living space is the massive master bedroom (Eastern King) with its' own en suite bathroom that has a double vanity, a rainfall shower, and a large tub to take a nice relaxing soak in. Besides the master bedroom, there are 2 other bedrooms (king and triple bunk bed) and a queen sized sofa sleeper in the sitting area along with another bathroom, bringing the total sleep count to 9 people. 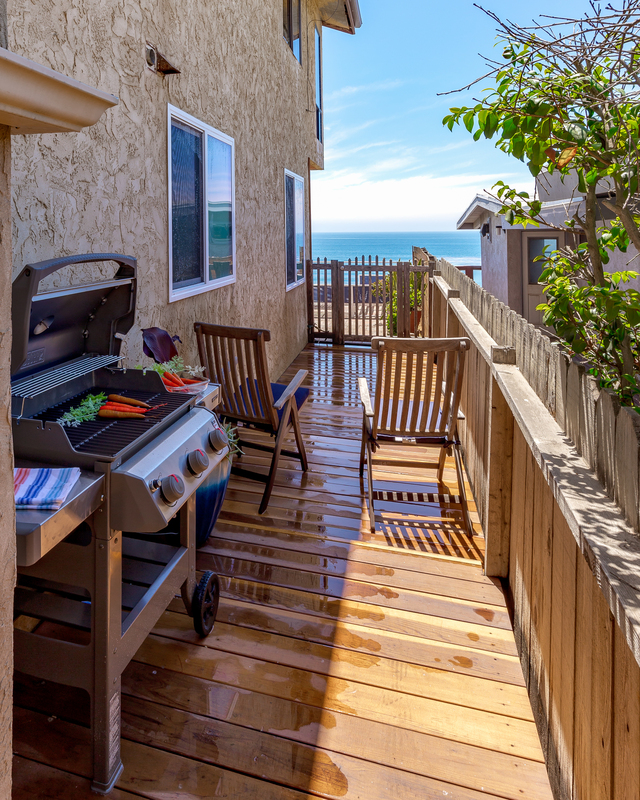 Encinitas offers visitors with a great selection of activities and places to visit. Some of the popular destinations are Swami's and San Elijo State Beach, two of the greatest surf spots within the area. If surfing isn't your thing Encinitas also has a great garden featuring lush plant life (The San Diego Botanic Garden) to visit. If you are willing to travel a little further outside of Encinitas, you could take you and your family to Legoland, an amusement park located in Carlsbad, CA. If you are hungry and want to get out and about the town, Encinitas does have several local restaurants, such as Vigilucci's Trattoria Italiana or Fish 101. There are also a couple of great breweries in the area like Encinitas Ale House and Culture Brewing Company. 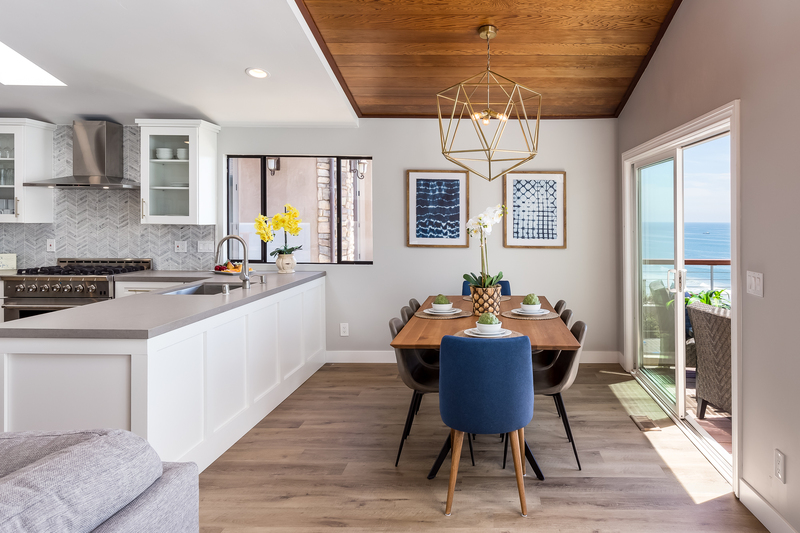 We, a family of 4 enjoyed this clean, modern, great kitchen, gorgeous views of the ocean beachy vacation rental. 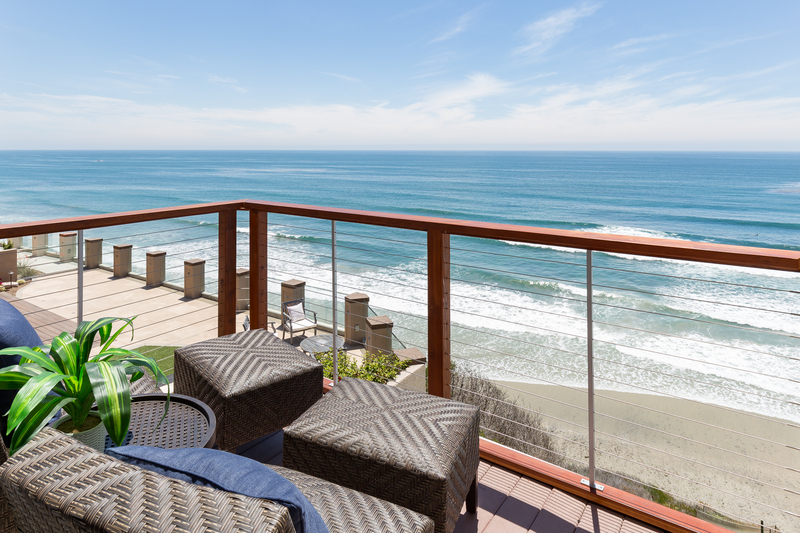 It is in the best location of Encinitas. The kitchen has stainless steel pots & pans (a must on my list! ), nice laundry facilities, updated bathrooms. I thought the master bed was comfortable, my husband thought it “sank” in the middle and didn’t think bed was too comfortable. Very clean property. 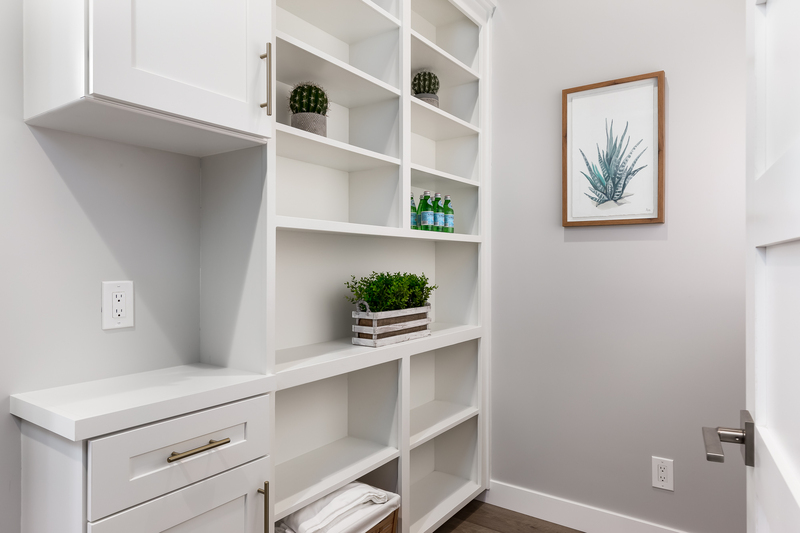 I loved the extra touches that you don't see in other rental properties. i.e., place mats, nice pots & pans, nice blankets! etc. Could have used some dinner forks but then probably some person helped themselves to your forks! I have had that happen in one of my rentals. One person even took the vacuum! Anyway great property management guys. Really enjoyed our stay and the view is to die for!! Beautiful space for a vacation. The views are absolutely stunning. Great place to watch the surfers and the whales. The house has all the necessary essentials to entertain and to just chill and enjoy the surrounds. Close to shops, restuarants and the beach. Off street parking is ideal. The one bedroom has bunk beds that are very cramped for adults to sleep in - so wouldn't recommend more than 2 couples (one king bed, one double in the rooms) The bunk beds are okay for younger teens. The sleeper couch doesn't have any privacy, its in the main living area. 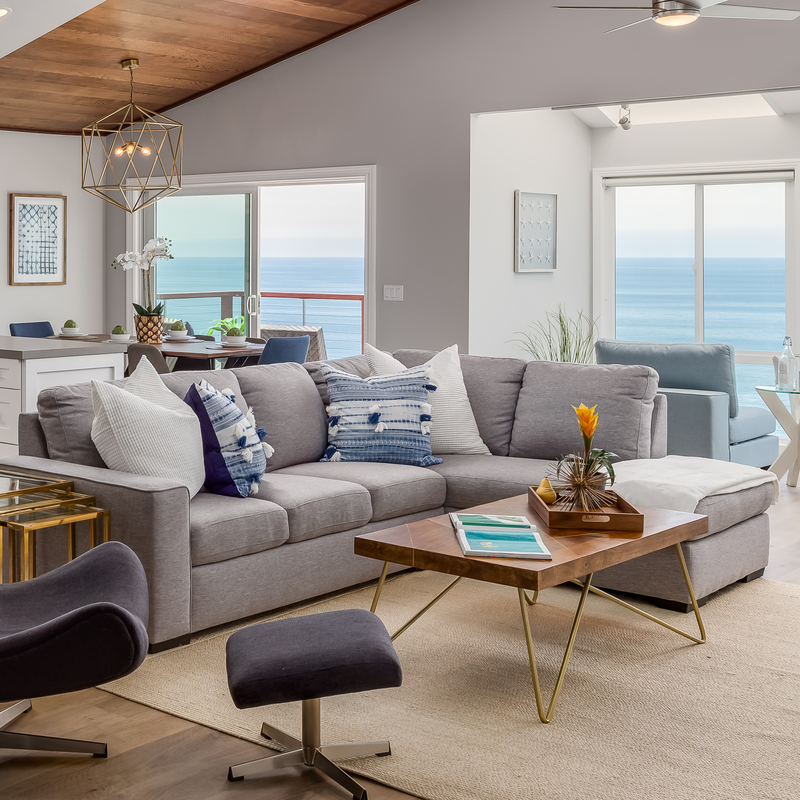 Wonderfully designed with high ceilings and ocean views. Spacious design had us always connected to the ocean. Our group of 5 adults will plan to stay here again. Great neighborhood restaurants...Buona Forchetta and Pannikin. Just steps to the beach and the entire comfortable stay felt as though we spent every moment on the water. This home is beautiful. But it lacks cookware and supplies. It had salt shaker but no pepper or can opener, etc. All the screens on every window were removed allowing bugs to enter. Master bedroom was missing a shade on a window. My biggest gripe was upon arrival we checked the bedding of all three bedrooms and found hairs and noticed it was not washed prior to our arrival. I took photos as proof. Stayed up till 2 am washing bedding. Extremely disappointing for a home that is about $700 per night. Thank you for your feedback David. We are happy to hear you enjoyed the home itself. We apologize for the lack of supplies that were present. This isn't a common occurrence, but just to ensure that this doesn't happen again we are taking the initiative and retraining all of our housekeeping staff members. In addition, we are also now requiring all of our properties to be inspected by our upper level management themselves to ensure that our standard for for cleanliness and inventory is met. We have also taken your comment about the screens to heart and have made a sign informing guests that "The Screens Have Been Removed to Enhance Your Ocean Views. They are Available Upon Guest's Requests. To Have Them Installed, Please Contact Our Maintenance Personnel at." We hope to have you and your party again sometime, hopefully to experience the changes that are being implemented. Warm Regards, The Beachfront Only Team. Thank you for your feedback David. We are happy to hear you enjoyed the home itself. We apologize for the lack of supplies that were present. This isn't a common occurrence, but just to ensure that this doesn't happen again we are taking the initiative and retraining all of our housekeeping staff members. In addition, we are also now requiring all of our properties to be inspected by our upper level management themselves to ensure that our standard for for cleanliness and inventory is met. We have also taken your comment about the screens to heart and have made a sign informing guests that "The Screens Have Been Removed to Enhance Your Ocean Views. They are Available Upon Guest's Requests. To Have Them Installed, Please Contact Our Maintenance Personnel at We hope to have you and your party again sometime, hopefully to experience the changes that are being implemented. Warm Regards, The Beachfront Only Team. Great experience! Good communication, easy check in / check out, incredible views and an amazing location! We spent 2 nights in this remodeled condo directly above Beacon’s. The master bedroom is spacious and quiet with stunning ocean views, bedroom towards street has king size bed with comfortable bedding and mattress. Third bedroom has a bunk bed which sleeps 3 and is a little tight but worked out for our group of 6. House was immaculate and although porch was small the views were amazing. Good enough for the two of us. Kitchen was well equipped and stove was fantastic. I will be coming back again !! !